"I endure by the sharpening"
Dignity in "their work" and well as your words, Mike. Beautifully done, as ever. I have that exact same hand ax. It has to be older than me. An object left lying around in my grandfathers garage after he died that nobody but me wanted. Well honed, it still does an excellent job. Thanks, Erin. There's not enough dignity accorded to, or pride taken in, hard work and preparation these days. It's sad. Your bamboo work speaks nicely to this as well, showing the beauty of old and simple ways. I'm enjoying it immensely. You have a good eye, Ken. 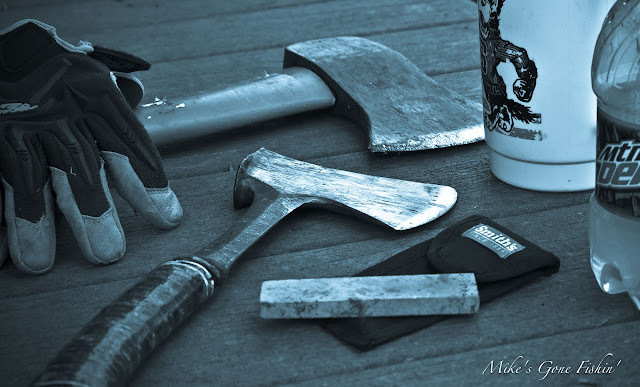 That hatchet was my father's, and quite possibly his father's before that. It's an elegant tool that is helping me through a cord of stringy hickory at the moment. Thanks for reminding me just where it came from. ...we can't all be scalpels. you're right, there isn't enough value in hard work anymore. really enjoyed the poem. keep em coming! Nothing like a Mtn Dew to fuel some hard work. Well said sir! Let's raise a pint to all of us axes! Nice Mike, I liked a lot. You're turning into quite a wordsmith. Longfellow ain't got nothing on you. I like it!